Events – Page 529 – Welcome to Wyandotte Daily! Polski Day is a generational event for Cathy Kolenda-Smith. Three generations of the Kolenda family are participating again in the preparations for the annual festival that celebrates Polish traditions and heritage. Today, the volunteers are baking about 2,000 Polish tea cookies at the All Saints church hall for the celebration on May 2. “My grandpa was from Poland,” Kolenda-Smith said, while her grandmother was from Croatia. After they moved to Kansas City, Kan., her grandfather and other church members helped build St. Joseph Church. “They worked in packing houses in the day, and at night, they worked on the church,” she said. Kolenda-Smith said the three generations of her family helping with the festival include her, her mother, and her three girls. Polski Day has been part of her life for a long time. “When we were kids, I would help in the kitchen,” Kolenda-Smith recalled. She would attend the Polka Mass and march in the parade, she said. She’s been in charge of the Polski Day festival for the past 11 years. 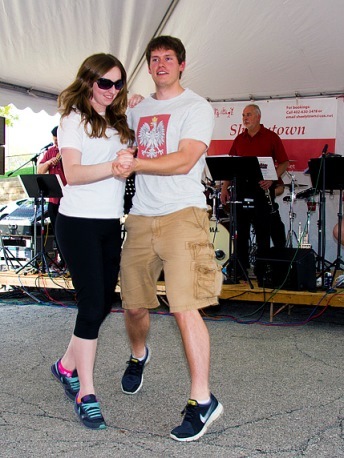 While Polski Day remains essentially a fundraiser for the church – now All Saints Church – for Kolenda-Smith, it’s also about sharing the Polish heritage with the younger generation. The signing of the Polish Constitution of Freedom was on May 3, 1791. 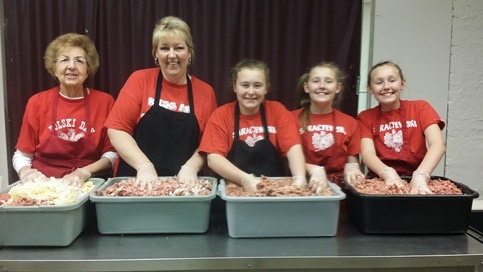 “There’s a large Polish population that has settled in the Greater Kansas City area, and there are people who come up to me, who stop me and say, ‘Thank you for doing this,’” she said. A few generations ago, many people of Polish origin settled on Polish Hill, north of I-70 and west of 7th Street Trafficway in Kansas City, Kan. Some of those with Polish heritage are now scattered out around the area, and Kolenda-Smith hopes this event can bring them together. Traditions are shown through food, music, dance, Mass and other activities. “I think a lot of parents try to pass it on to their kids,” she said. Many people have been busy making items for the festival, most notably a quilt by Ethel Golubski, who has been making quilts for the festival for five years, and a painting by Mike Savage. Kolenda-Smith said 100 percent of the proceeds from Polski Day will go toward All Saints Church. “Last year we put in a new sound system in the church,” she said. The new system includes a feature that helps the hearing-impaired. Last year the Polski Day committee found out that some of the church members with hearing aids could not hear properly in church because of feedback, and the new sound system will help them, she said. That has included the roof and air-conditioning system, she said, and in the future there are hopes of making other improvements. “It’s a small church, but we try to keep it running the best we can, and Polski Day is a big help,” Kolenda-Smith said. This year, there will be a Polish choir of 40 members who will sing at the Polka Mass at 4 p.m., she said. They are coming from various churches throughout the Greater Kansas City area, she added. Sheely Town, a band from Omaha, Neb., will play during the festival, she said. The Ed Grisnik Band is scheduled to perform. A strolling accordionist, Jim Baric, also will entertain at the event. There will be activities for all ages, she said, including games for kids. “You’ll have good food, too, I promise you that,” Kolenda-Smith said. This year, new food items to be offered at the festival include apple strudel, and eigos, a Polish hunter’s stew. Mostly, however, it’s the same fare as usual, Kolenda-Smith said. 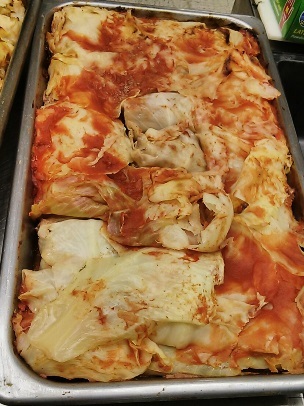 Festival organizers estimate that 200 pounds of cabbage and 380 pounds of ground beef will go into making 2,700 cabbage rolls for the annual festival. 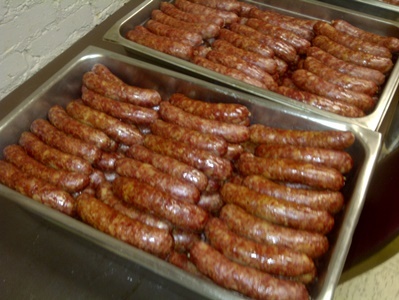 Besides that, they are preparing 375 pounds of Polish sausage, 165 loaves of powitica and 3,000 pierogi. The 31st annual celebration will be Saturday, May 2, at All Saints Church, 8th and Vermont, Kansas City, Kan. A parade begins at 11 a.m. at 14th and Central, with the festival from 11:30 to 7 p.m. at the All Saints grounds. A 4 p.m. Polka Mass is part of the celebration. Kolenda-Smith is keeping a sense of humor about the Polski Day event. The parade route, after starting at 14th and Central, turns east on Central to 8th Street, going the wrong way on a one-way street until it reaches the church at 811 Vermont, she said with a laugh. The parade and festival are open to the public, and more details about it are at polskiday.com. There is no admission charge, but there will be a donation for food and some items such as T-shirts will be for sale as part of the fundraiser. Preheat oven to 350 degrees. Cream butter, gradually add sugar, beating until light and fluffy. Sift together flour and salt; add to cream mixture. Add more flour if needed, to make dough easy to handle. Add finely chopped pecans. Chill dough at least one hour before using. Shape dough into 3/4 inch crescents, place 2 inches apart on greased or lined cookie sheet. Bake at 350 degrees for 12-15 minutes or until lightly browned. Roll in confectioner’s sugar while still warm. Makes 6 dozen. Store in air tight container for 1 week or freeze up to 6 months. The Wyandot Chapter, Daughters of the American Revolution, will meet at 10 a.m. May 2 at the Lone Star Steakhouse, 1501 Village West Parkway, Kansas City, Kan. The guest speaker will be Elizabeth Kelloff and one other member of the Capt. Jesse Leavenworth DAR. The meeting topic will be the enactment of an 1850 interview with Caty Sage. Caty was kidnapped from her family in Elk Creek, Va., at 5 years old and grew up to become a Wyandot Indian queen. After 62 years she found a bloodline brother at the Wyandot Reservation, (then) Leavenworth County, Kan., according to the book, “The Legend of Caty Sage” by Ellie Kirby. To send in items for the Faith News, email information to news@wyandottepublishing.com. Please include your name and contact information. A Community Blood Center blood drive is scheduled from 3 to 7 p.m. April 27 at Christ the King Catholic Church basement, 3024 N. 53rd St., Kansas City, Kan. For more information or to schedule an appointment, call 816-753-4040 or visit www.savealifenow.org. A Community Blood Center blood drive is scheduled from 3 to 7 p.m. April 20 at Parkway Baptist Church classroom, 12320 Parallel Parkway, Kansas City, Kan. For more information or to schedule an appointment, call 816-753-4040 or visit www.savealifenow.org. A Peace Walk is scheduled from 1 to 3 p.m. Sunday, April 26, at Sanctuary of Hope Prayer and Retreat Center, 2601 Ridge Ave., Kansas City, Kan. The Sanctuary of Hope also will hold a Hopefest from 10 a.m. to 2 p.m. Saturday, June 20, with music, balloons, games, a variety of food, and a tour of gardens and retreat facilities. For more information, visit www.sanctuaryofhope.org or call 913-321-4673. The community is invited to the installation service April 26 of the Rev. Terra Pennington to pastor of The Sanctuary Place. The Sanctuary Place at 3500 Dodson St., Kansas City, Kan., is a new open and affirming worshipping community that seeks to holistically collaborate with other faith communities, nonprofits and civic leaders in Wyandotte County. It is on the site of the United Church of the Good Shepherd. Pennington graduated from San Francisco Theological Seminary with a passion for finding new and creative ways to do church. The service will take place at 4 p.m. April 26. A light supper will follow. The Heartland Presbytery of the Presbyterian Church USA is sponsoring the new Sanctuary Place. Members of St. Paul’s Episcopal Church, 1300 N. 18th St., will observe the fourth Sunday in the Easter season April 26. The service in English will be at 10 a.m.; the Spanish service will be at 7 p.m. Send in items for the Faith news to news@wyandottepublishing.com. Please include your name and contact information.